Boswell Book Company is proud to present a pizza party event for kids ages 14 to 84 with The Gentleman’s Tour featuring authors Jason Reynolds, John Corey Whaley, and Brendan Kiely. Sharing themes of teenagers facing difficult decisions as they find their footing in a challenging world, these three authors will each read from and sign copies of their latest novels and field questions from the audience. In 1971 a group of unlikely activists—ordinary people from diverse walks of life—broke into an FBI office just outside of Philadelphia and stole thousands of files that documented the dirty tricks, Constitutional violations, and domestic spying of J. Edgar Hoover’s “shadow” agency. Washington Post reporter Betty Medsger was the first to receive and report on these files. For three years she made headlines and history with this information, and continued her investigation long after she left the paper. After decades of silence, the former Philadelphia Evening Bulletin reporter convinced the anonymous activists to come forward with their story. In The Burglary, Medsger details how their actions “dealt the first significant blow to an institution that had amassed enormous power and prestige” (The New York Times) in this chillingly prescient tale that seems to foreshadow post-9/11 spying and state secrets. A former chair of the Department of Journalism at San Francisco State University and the founder of its Center for Integration and Improvement of Journalism, Medsger is also the author of Winds of Change, Framed, and Women at Work. Grafton was born in Louisville, Kentucky April 24 1940; graduated University of Louisville, BA 1961 with a major in English Literature, minors in Humanities and Fine Arts. She married to Steven F. Humphrey with three children from previous marriages: a daughter, Leslie; a son, Jay; a daughter, Jamie; and four granddaughters, Erin, age 21, Kinsey, age 13, Taylor, age 4, and Addison, age 2. Sue Grafton's book The Mystery Writers of America Cookbook was available from LibraryThing Early Reviewers. 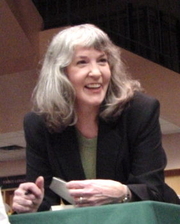 Sue Grafton is currently considered a "single author." If one or more works are by a distinct, homonymous authors, go ahead and split the author. Sue Grafton is composed of 16 names. You can examine and separate out names.